Duel wielding weapons in Red Dead Redemption 2 is a brand new feature for the prequel, and this guide will show you how to get a new weapon holster. Back before Red Dead Redemption 2 actually launched, Rockstar revealed that Arthur Morgan could wield two weapons at once. In this guide to the wild west prequel, we'll be walking you through how to dual wield guns in Red Dead Redemption 2 as easily as possible, so you can equip two pistols or shotguns at once. But if you instead need help with anything else relating to Rockstar’s latest game, you’ll want to head over to our Red Dead Redemption 2 guides hub. It’s on this main page that you can find all the information you need for the opening few hours of the game, including a comprehensive index of all our in depth guides pages on the game. Can you Use Dead Eye While Dual Wielding Weapons in RDR2? 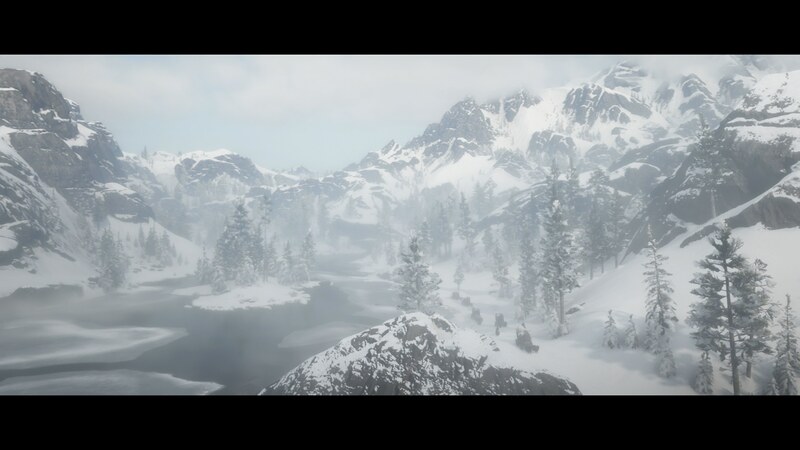 At the very beginning of Red Dead Redemption 2, you’ll meet Arthur Morgan and the other members of the gang struggling through the snowy mountains. This section acts as the prologue for the game, and it’s not until after you’re out of the mountains that the game properly opens up, letting you explore the whole open world. It’s also in this section that you’re first able to wield two weapons at once. After roughly five hours of completing main story missions in Red Dead Redemption 2, you’ll be given the a second holster for Arthur Morgan to equip. This is a reward for completing Micah Bell’s opening mission, "Blessed are the Meek", which sees the pair of you raising hell in a small town out west. Once you’ve been given the second holster, you can equip two sidearm weapons. Sidearm weapons count as weapons that you can wield and fire using one hand, so pistols and sawn-off shotguns fill this role. To equip two weapons at once, all you need to do is bring up the item wheel by holding the left bumper while on your horse (weapons are stored in a bag carried by the horse), and hold the right stick over either of the two item slots at the top of the wheel. The right slot represents the weapon that you’ll wield from your right hand when dual wielding, and the left slot represents the weapon that your left hand will hold. To wield both weapons at once, you want to hit the space on the item wheel in between these two sidearm weapons, right a the top of the item wheel, and in the middle. Doing this will immediately draw both weapons in each hand, letting you fire at will. 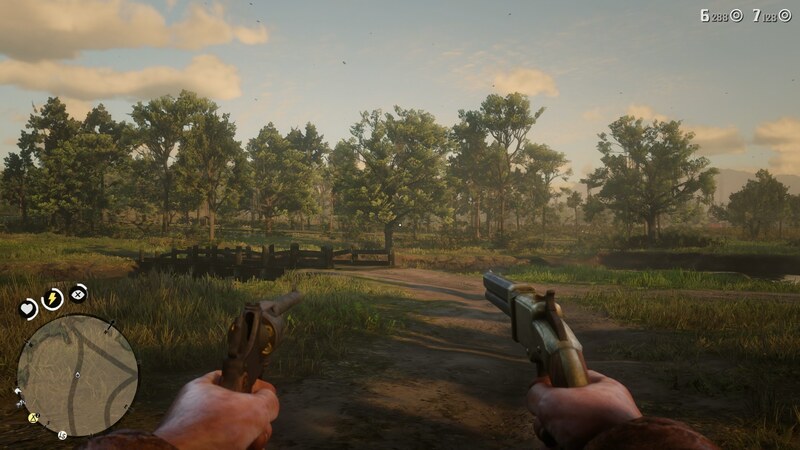 Note that it is possible to equip two versions of the same weapon at once in Red Dead Redemption 2. 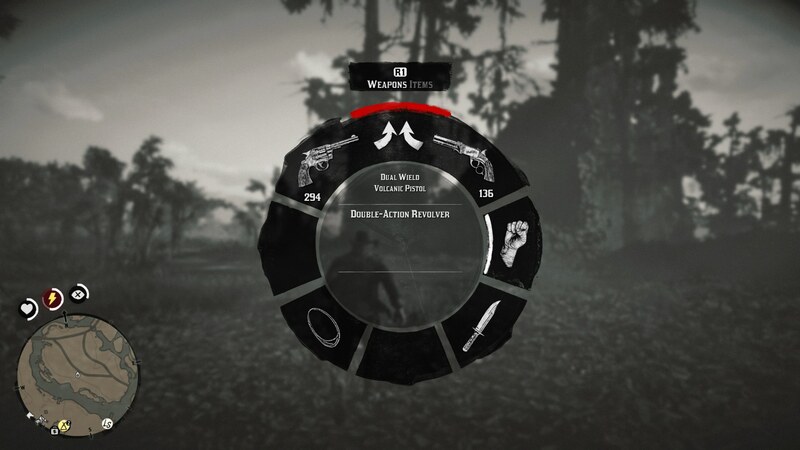 If you already own a particular weapon, say a double action revolver, when you hover over the purchase option for the weapon at a Gunsmith, you'll be given the option to "Purchase secondary", this allowing you to buy a copy of the weapon. You can upgrade two versions of the same weapon completely independently of each other at the Gunsmith, so it's possible to equip two versions of the same weapon, one with a longer barrel for example, and one with a scope. Two guns are better than one, no? In Red Dead Redemption 2 you can fire twice as many bullets at a foe if you've got a gun in each hand. You can also use a pistol to fire from mid-range, then easily fire off a shotgun blast as you get closer to a target. You can indeed use the Dead Eye system while dual wielding weapons in Red Dead Redemption 2. When you're using Deadeye mode while dual wielding two weapons in Red Dead Redemption 2, it allows you to fire off more shots at once. This is because you're using up the magazines of two weapons instead of one while using Deadeye, so you've got more shots to place on enemies. There's no accuracy penalty while dual wielding weapons, so you don't have to worry about your shots missing from a distance. This brings us to the end of our Red Dead Redemption 2 guide on how to dual wield, and you’re all up to speed on everything you need to know. You can now check out our Red Dead Redemption 2 weapons customization guide, or our page on how to pay off a Bounty in Red Dead Redemption 2, for more help.